Pensioner Fares apply to Australian and New Zealand Pension Card holders, Australian Senior Card holders and full time Australian Students. Children between the ages of 2-15 years will be applicable for child rates. Children under 2 years are considered infants and travel free of charge when seated on a parent or guardians lap. Child seats are unable to be used. Please visit this link for tentative pick up information. Please note that reconfirmation is still required prior to departure as per your travel documentation. 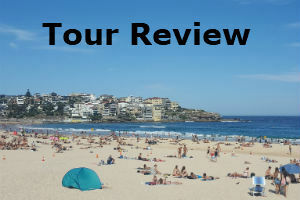 This tour returns at 5.45pm to the Sydney CBD. Limited hotel drop offs are available. Passengers adding an optional extra with a luncheon cruise will begin their cruise at Midday, with checkin at 11.45am..
Just advise which of these locations you wish to be picked up from in the Additional Comments field of the booking form, or the day prior to travel (we will provide you with full contact details via email after you have made your booking). The coach will not attend a location unless a pick-up is prearranged. Please note the times listed are approximate and ALL bookings MUST be reconfirmed with the operator the day before departure. 3hrs 45mins. Tour duration is 6 hrs if you have added the optional extra lunch. Today you will see some of the best sights that this beautiful harbour city has to offer. Your Driver Guide will provide expert commentary as you weave your way through the bustling city streets to key landmarks. Situated at the very base of the Harbour Bridge, the Rocks is a lively and popular spot for locals and visitors alike. In a time long ago, the area was inhabited by the indigenous Gadigal people, before the first European settlers claimed the land in 1788. Your Driver Guide will share stories, both tall and true, of the characters and events that shaped this port community. From the Rocks you will get a stunning view of the Sydney Harbour Bridge, the largest steel arch bridge in the world. Mrs. Macquarie's Chair sits high on the peninsula known as Mrs. Macquarie's Point. The chair is an exposed sandstone rock that was hand carved into a bench by convicts in 1810. It is said that Mrs. Macquarie, the wife of the then NSW Governor, was known to visit the area to take in the views. From Mrs. Macquarie's Chair you will get a birds-eye view of arguably the most recognisable icon in the World, the Sydney Opera House. This World Heritage listed building is considered a masterpiece of late modern architecture and a world class performing arts venue. You are now heading to the entrance of Sydney Harbour, known as the Gap. A dramatic ocean cliff on the eastern coast of Sydney, the Gap will give you breathtaking views of the New South Wales coastline. Australians are renowned for their relaxed and outdoor lifestyle and Bondi Beach is a prime example of this. One of the most famous beaches in the world, it is a captivating location brimming with lifeguards, surfers and tanned beach-goers. You can wander along the shoreline and dip your toes into the cool ocean or treat yourself to something from one of the many cafes and restaurants (own expense). On the return journey your Driver Guide will take you through famous suburbs such as Double Bay, Paddington and Kings Cross, each with its own unique streetscape and intriguing history. You may choose to upgrade your tour with a pre-tour luncheon cruise on Sydney Harbour. Enjoy a fantastic buffet lunch and commentary to set the scene for the remainder of your day. Once your lunch cruise docks, you will be escorted by a cruise representative to join your coach tour. Cruise Sydney Harbour aboard the prestigious MV Sydney 2000 and enjoy a fantastic buffet lunch and commentary.